This is the very first photograph I took at the Occupy National Gathering event. As I was walking through the Liberty Bell Center, the retired Philadelphia Police Captain, Ray Lewis, was standing in front of the line of visitors with his sign held up: "To understand us, watch Inside Job. A free online film about Corporate Greed". Last November, Captain Lewis joined the Occupy Wall Street protests in New York City wearing his officer's uniform. He was arrested during the protests, and later punished for supporting OWS. People of conscience and stature like Captain Ray Lewis frighten the plutocracy! While the Occupy Movement is going through infighting and debates about Black Bloc tactics, Captain Ray Lewis sets an example for us. He understands that in order for the movement to succeed, we have to inform and educate those who have been continuously misinformed and disinformed by the mainstream media. That is why, he was standing in the most visible section of the Independence National Historic Park with his simple but effective banner, while some of us were sitting around, arguing about nothing. 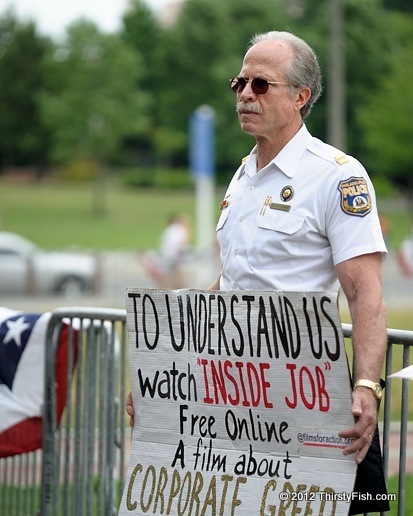 If you have not already seen the documentary Inside Job, then please make sure you see it.